At this stage of the course you should have your website created! Congratulations, this is a big accomplishment! Looking back to 2002 when I started my career in Online Business it took me 30 days just to figure out how to build a website. There definitely weren't any platforms like SiteRubix out there. What takes 30 seconds now, took 30 days back then. In this lesson we are going to be walking you through the process of the initial website set-up. This includes the removal of "default" content that is installed with every website as well as a look around of the back office of your website. Additionally, I am also going to be walking you through the activation of your "Plugins" and be walking you through the benefits of the plugins (feature extensions) that have been installed automatically with your website. Below is a video walk-through showing you the process of setting up your website. Click play to watch the video below. In order to do this, you need to log into your website. This is very easy to do and can be done using the "Log In!" button (as shown below). This will automatically show you all your users you have associated with your website and from there you can log into your website. No more need for manual logins and the passwords within your account are encrypted and secured using SiteRubix technology! You can also find your website login details, username, and password within the Details link on your SiteManager dashboard. 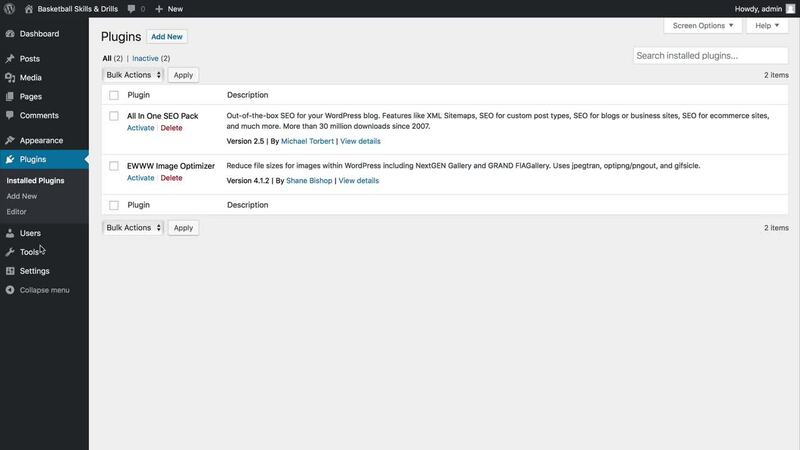 After you login, you will see your Wordpress administration dashboard for your website (see below). This may look completely foreign to you if you have never logged into a WordPress website before, but don't worry, you will get the hang of this and there is a ton of help here within the community to work you through any questions/issues you may run into. Wordpress is the most powerful and widely used website platform in the world. It is used by over 30% of ALL websites (millions) and it also has a wide range of "add ons" known as plugins that you can use extend the functionality of your website. When you install website here at WA we pre-install two of the most useful plugins with your website automatically and your first step is going to be activating these plugins. 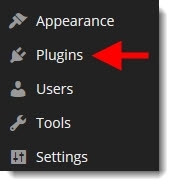 To do this you will want to click on the Plugins tab within the menu. You are going to want to go through and activate the "All in One SEO" and "EWW Image Optimizer" plugins. You can do that by clicking the "Activate" button (as shown below). Upon clicking Activate, these plugins are now "activated" and ready to go. The All in One SEO plugin will take a little bit of set-up, but this will be discussed in detail in the next lesson. Every new Wordpress website that you install will come with "default" or dummy content that is added with every website install. You want to get rid of this content before you can start creating content that is relevant to your niche. 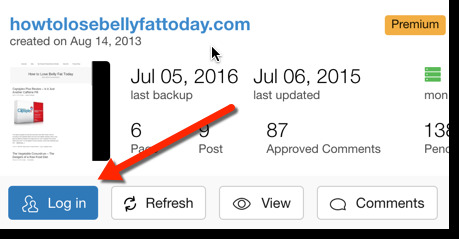 The first thing you want to do is delete the default post that is added with each website. Click on the Posts button, within the side menu. This will take you to the posts page where you will go to see a list of all the posts on your website. A post is simply a content page on your site (we will be explaining them in more detail later). Simply "mouse over" the post area and it will reveal the post management buttons. You will want to then click the "Trash" button. This will delete the default "Hello World!" post. Do the same with the "Pages" link as well. **Do note that there may not be both default Pages and Posts. If that is the case, just move on. That is it for this lesson, nice work! You now have a live website that is set-up and ready to go. This is your own Internet "real estate". You will use this website to connect with your niche and ultimately earn revenue through. This website is your foundation for building a successful online business! The next lesson we are going to be showing you how to get your website ready to rank in Google and other search engines! ==> Did You Know Premium Members Experience 5 TIMES As Much Success? any suggestion for my About me content? Is it any thing I need to improve? I'm Isabel Chau and joined the in Hong Kong, a normal life and simple mind lady in Hong Kong. As my previous staying simple life, one a day, I have a chance to get know how to create own online business, share with other people (included my family and friends) and help people more cheerful in their life. I have joined the yoga class when I am study in my first job life, just wanna to make more relax before or after work. Searching closed to my home place, there have many relax activity class but yoga this word makes me curious so I join it immediately. After my first yoga class, I feel very relax mode during the class and enjoy end of part - Savasana after to do some yoga pose and wear the yoga professional clothes, yoga mat...etc, it makes me refresh my mind and eliminated the angry mode, stress mode, worry mode....etc. I would to share any yoga accessories product to make you more professional to do yoga, share yoga cheerful in my website and welcome you can share any about yoga to us as well. I am still not a premium member. I have watched all 9 lessons and created a website but not sure if I missed something or not? In 'posts', where my 'About' post, it has nothing for SEO title, description, key words (in the RHS most) . Have I missed something here, which lessons are these involved? There are ways to rank your about me page or post and since the brand your building is you that's not a bad thing to get hits to that page. Level two training goes into depth on ranking pages with keywords and building your own site traffic. WOW, I read Get All of the "Juicy" Details About Premium Here! and I'm very amazed of all testimonials of all the people who have tried WA and are now succedding online. Most people say that it takes time to see good results, some people are egared to make money ASAP, but with WA you need to give it time at least 3-4 months or some times more. I will try my best with WA and I know for sure that I need pascience, with hard work and consistancy some day I will make the income that I'm dreaming for. Yup! With spirits like this I can't totally rely on you guys for inspirations. You, Us will make it, that's a must. H I am Having a hard time writing my about me post this what I have.﻿About me﻿. I am Not very good with words. ﻿Help People find cordless tools. Looks like a great start! Be sure to run it through grammar.ly or just ask another person to read through to catch any possible spelling/grammar errors. I can't speak for everyone else, but personally, when the grammar is off, it makes me question the products. For example: when you started your about me, the cordless tools would be the proper set up. You mention loving to use power tool ever since you were "aloud" to. Generally, when a person says "aloud", they mean verbally saying something. "Allowed" would be the proper word. So on, so forth. Best of luck to you!! Good on you for having a go. You sound passionate about what you do. Don't let your lack of writing skills hold you back. Can I ask is English your first language? The best way to improve your writing is to read other peoples posts. That way you will improve on spelling and sentence structure. Try to get in the habit of using the spellcheck at the end of each paragraph. What I do is write content. Leave it for a bit. Go back and read it (out loud is good) and tweak it abit. hi, may I know that my target niche will be limited by my country? I am living in Malaysia, if my website is linked with Amazon Affiliate Program or any products that only selling at US, my website traffic will become low on Google? Hi - you can join any of the Amazon sites from any country. The internet is a global marketplace. Amazon also has a feature called OneLink which directs customers to the correct site for their country. For example, I am in the UK, but most of my traffic comes from the US, so I am signed up with both versions of Amazon. Sounds like an interesting niche and one in which you are passionate about. That's really the key as it means you are far less likely to burn out creating all of the required content. I think your next step is to start researching and see where the market is at. Start with "sports ministry" and run the numbers on Jaaxy, as well as doing a Google search to see what's already out there. Get a feel for if the niche is too big, too small, or just right. Then repeat that process with various keywords and/or post titles that you might like to write about. Again, you're trying to get a feel for where you need to be. Spend a few hours going through this process and you will have a pretty good idea on how to proceed. Any niche can be successful, but sometime you have to find an angle that separates you from the crowd. I would recommend that you don't just focus on "bee honey" as that is more of a product (albeit a delicious one!) In other words, there's only so much you can say about it. Think bigger. Instead, share your 18 years of experience. By talking not just about honey, but about how one gets started, how to work with different bees, the types of equipment needed, various extraction techniques, and how the purification process works, safety tips, and so on, you could have enough material to write for years to come. I am really having trouble with the Site Content and just doing the About Me page. I have already hit the publish button and what I have written is not even in the correct place. Its hard to go back to the video and was just going by the written instructions in the lesson. Now I don't know how to put what I have written into the proper place. Doug, do you have a domain set up in Siterubix yet? What's the link to your site? Maybe we can take a look and see what's going on. Don't worry, you can organize all of your menus in any way that you like through custom menus. You can add these custom menus to organize your top menu in any way in which you like, as well as create sub-menus (for themes that will support this). You can also use these custom menus to add within your side widgets on your website (within your sidebar). Here is a tutorial on how to create custom menus: Creating Custom Menus, Navigation, & Widgets I use custom menus on all of my websites (over-ride that default menu). It allows much more control and organization....both good things! I’ve decided! My niche shall be anime merchandise! The world should know more about the greatness of anime! Leaving that aside, how does one go about getting traffic for their domain/website without actually having any products set up yet? Do you just advertise? I know I’m probably asking this right before the answer will be given to me within the next lesson or something. So one has to have enough traffic within their domain before a company will do business with them...I am wondering how one creates traffic without having any product on sale? Hi - yes, this covered in the training. Basically, you will be writing articles about your chosen niche which will attract traffic. You will be learning about keywords - these are what people use when searching for something in Google. After watching this video, I have 2 immediate questions. 1.) Does it cost money just to create and/or maintain a website one would be using as an affiliate? 2.) Are there certain criteria one has to fulfill before one can become an affiliate for any company? I can’t imagine companies would willingly allow every single website that approaches them to promote their products, am I correct? If so, then what is the process and what are the criteria? I can also imagine different companies having different requirements so simply telling me what you’ve faced should suffice. Thank you for your generous answer. You can start with a free website here on WA. It'll be a Siterubix website and not a .com or something like that. But it's free. So you could start out without paying anything. Otherwise you'll pay $10-$15 a year, depending on the extension you chose (.com is a bit more expensive than a.nl for instance). Different companies have different criteria. Some look at the numbers/traffic, some at the quality of your content. I joined the affiliate network ShareASale and found over a dozen merchants that I applied to. I got turned down by only 2. At that time I only had 5 blog posts on my website and just about the same number of visitors a month. If you write good quality content about a clear, defined niche and you find the right companies/merchants to match your content and niche, that's when you shouldn't have a problem being accepted. Amazon accepts everyone for the first 180 days. But if you don't make 3 sales in those 180 days, you lose your affiliate account. So it's best to wait applying to Amazon until you've got traffic to your site and to your social media accounts. Regular full price is $49 a month or $359 per year. Wealthy Affiliate can work for anyone but does not work for everyone because everyone applies what is learned differently and not all have the staying power to wait 6 months to a year for serious results. They try to rush and pray for 30 to 60 day miracles that only occasionally happen. full monyhly fee is $49 or you can opt for $359 per year. If your anything like me, all of this is very much new too me. I have interest in one thing, MAKING MONEY! Of course in this day in age making money is never that simple, or is it? This program is very informative & is constantly keeping my head over flowing with ideas. Though i have yet too make anything. I am new too this just like you. Catch me in a year! See you in Vegas baby ✈️. I think I have the "About me" content just about finished. Between the "Vision" and the "Goals" sections of the template, I feel like they are pretty much the same for my website. I just thought I would leave it here for any suggestions. As always, I love to hear feedback from the community here at WA. Hello everyone and welcome to my website! Here you will ultimately find me just having a blast with my Labrador Retriever (Toby) and I would like to share some training tips that I have learned. My name is Mary and I guess you could say that I am a Labrador Retriever enthusiast! My love for the breed all started in my early teens when my stepmother and I visited a local Humane Society and adopted my first Labrador. I was really excited and waited anxiously until the day they called and announced he was ready for his new home. Cisco was a year old when I first met him at the Humane Society and he quickly became my best friend. At that time, I helped to train him on basic obedience, some grooming (bathing & brushing, my stepmom knew how to clip his claws). I took him for hikes, walks everywhere, played fetch, swam with him, and ran with him in the yard. He never seemed to tire out or get bored and he loved to play with kids. Cisco passed away at a healthy age of 16 in my father's home in 2013 and the thing I've missed about him was the love and happiness you could clearly see in his eyes and his "ride or die" companionship. Today, Toby is 11 months old and I've worked on his obedience and training on my own. Some things work and some things don't, but I've enjoyed working with him just the same. Don't get me wrong, I do seek out tips and advice with training whenever I get stuck or it seems that some methods of approach aren't working. I stay at home full time and I'm currently pursuing my BA in Logistics and Supply Management. Having the opportunity to attend online college courses allows me to spend more time with my best friend and ensures that he's never lonely either. ﻿I'm creating this website really as a visual project or video journal of my training sessions with Toby and to capture those moments of behaviour that I may seem to miss. I'm sure that I'm not the only dog owner out there that enjoys learning everything about her pet. ﻿My vision is to help other dog owners passively train their dog "DIY" style. I've taken on this approach because I strongly believe that the #1 way to bond with your new dog is not only through playtime, but one-on-one training sessions and obedience. By taking this approach on myself, I've found the best results of Toby and I having a mutual respect for each other and he's quickly taken on looking to me for guidance as he explores and discovers new things around him everyday. Great page. Way to go! Hi everyone. When I was on this training and Kyle explained how to enable Keywords, his video shows a keyword box that opened up and he put in a few keywords. I know he said it's not too important to getting ranked (like it used to be), no box opened up on my screen when I clicked enable. Will that cause a problem now or in the future??? Thanks. Hi as n new free member or premium member is it possible to create a domain out with siteRubix and attach it to my website? The reason for asking is I am not sure if for any reason I decided to unsubscribe(which at this point I doubt is unlikely) I would like to know if I would be the owner of the domain? I have had advice to keep my domain and hosting separate. If it is not likely you will unsubscribe, follow the lessons and within short WA will ask you to register your own domain. At WA there is no need to keep hosting and domain separate. In fact I don't see why that could happen anyway. Hi Steve, welcome to wa. when you become a premium member you get hosting here for up to 25 domains you buy and you get 25 siterubix sites. as a free member you get two free siterubix sites. if you host your domain here then if you leave you just trnsfer your domain to another host, no problems. i think the advice comes from where the industry standard is that if you buy a domain from somewhere you get ripped off with hosting costs. this is not the case here - $14 for a domain and if you take the black friday yearly costs, about $25 per month. the hosting is locked down pretty solid - nothing gets in, but then you need to ask for things to talk out. but support here is pretty quick and open all day. but there is no problem hosting your domain here and building your site out, and if you decide to move on , no problems. if you start with a siterubi, you can easily transfer your work to a domain you buy , if it is hosted here. a couple of clicks and it is done. good luck with your decision and getting out of the rat race. There are 2 main criteria when choosing a niche. If the answer is yes to both then it is worth trying out. Thanks Kyle. I feel that the more we all help each other the more success we will all have. I love Jacks. Maddie was great...If you were sitting down watching TV, that's what she was doing but, if you were getting all excited and what not, she's be bouncing all over. Here's an image of her and Jake (Jake is still with us). There's also a picture of Lucy. Although not really, we tell people she's a rescue and show them this picture, LOL. Hahaha! That's absolutely true. Jacks seem to enjoy being a "lap dog". I still have to go some more research on the breed. There's a few factors I know that I'm facing when training. Mason's a senior dog and Toby is a youth, both are male which contributes to dominance, and Toby isn't fixed yet. I'm not planning on fixing him until he fully develops hormonally, typically by 2yrs. Mason has had some house breaking training but done in a different manner than what I'm teaching Toby.